To prevent spam or defamatory posts from appearing in your online publication, it's often necessary to moderate comments from readers before they are published. A CAPTCHA can prevent some automated spam, but it cannot prevent spam being entered into your publication's comment form manually. If you have configured your publication so that logged-in reader or public comments are moderated, the reader will see a message indicating that their comment has been sent for approval before it will be published, or not published, as the case may be. The list of reader comments can be found by clicking Content, then Comments, on the main navigation menu. By default, all comments are shown. On the left hand side of the Comments page are checkboxes for showing just New, Approved, Hidden, Recommended or Unrecommended comments. Click the Filter button to update the list of comments. The default list length is 20 comments per page. There is a Search field to help you find a specific set of comments, perhaps on a topical subject. Search results can be sorted by Author, Date/Comment, or Article name, by clicking on each column heading. Click the checkbox to the left of a comment to select it, or click the checkbox in the table header to select all comments. 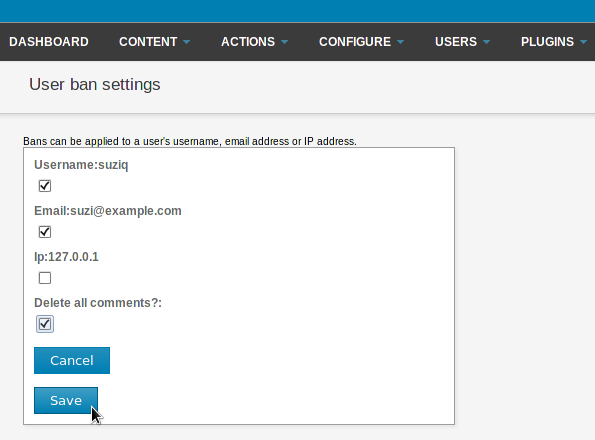 Once selected, a drop-down Actions menu above the comment list enables you to update a New comment's status to Approved, or Deleted if it is spam. Alternatively, the comment can be Hidden, which does not delete the comment permanently. Click the Ban/Unban user button to open a page in which a user can be banned from commenting on the publication in future. Bans can be made on a specific user name, email address, IP address or a combination of these details. 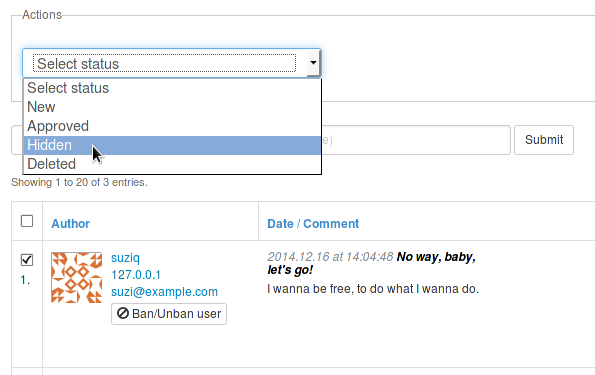 There is also the option to Delete all comments posted by a particular user when that user is banned. On the right-hand side of the comments list under Article is a link to a preview of the article each comment relates to, and details of the article's publication and section. There is also a shortcut link Go to edit article in case a clarification or revision is required, in light of the comments made. Mouse over a comment for a row of moderation buttons to appear, including Quick edit, Reply, Delete and Recommend.